Listening to the commissars' latest wheeze for dumbing down the NHS - getting pharmacists to replace GPs - you have to guess they don't visit many chemists. Judging from the queues and the waits, many chemists have problems simply dealing with their existing workload. So how much is this "plan" meant to save? We have no idea because they haven't said. 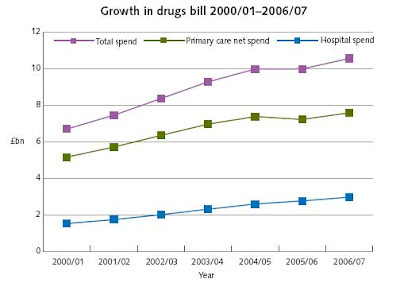 But with increase in GPs salaries, pharmacists on £35-60,000 pa have to be cheaper. Right? Almost certainly wrong. For one thing, NHS Redirect shows us precisely what would happen if chemists were asked to deal with anything beyond simple coughs and sore throats: patients would waste time speaking to a pharmacist who would then refer them onto a GP anyway. As the National Audit Office discovered, far from reducing NHS costs, NHS Direct actually increased them by around £100m pa (see this blog). Plus of course, if the pharmacist did diagnose but got it wrong - highly likely with anything other than coughs and sore throats - we would see a further splurge of emergency hospital admissions (just as happened with the Gershon "efficiency" cuts in hospital stays, and the loss of GPs out of hours service). They've already tried to force chemists to do more. For example, they introduced Medicine Use Reviews (see here), whereby chemists get paid to summon their regular customers in for a meeting, during which they tell them to stop using so much medicine. 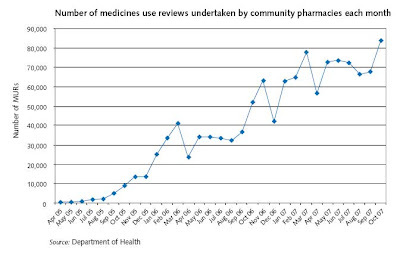 Just one problem- although the number of MUR meetings has exploded (see chart below), there is zero evidence it's cut costs; in fact the pharmacists seem to use them as a way of earning even more. A classic unintended consequence that was actually all too predictable. And what do we think would happen if pharmacists - the very people who benefit financially from selling more medicine- were given authority to prescribe drugs? And how do we think the big pharmaceutical companies would stop themselves providing huge additional incentives for chemists to maximise sales? Finally, ask yourself this question: next time Alan Johnson gets sick, do you reckon he'll be popping down to join the queue at his local chemist in Hull?